Telling your boss that you’re leaving the company is never an easy conversation. But a respectful resignation letter can mean the difference between an awkward goodbye, and a chance for a long-term professional connection. Ideally, you’ll provide a resignation letter two weeks before you leave the company. A resignation letter lets you officially announce your termination at the company, and also provides important housekeeping information, like your last day and other details about your departure. Arming yourself with a powerful resignation letter helps you ensure a positive conversation with your boss, and a smooth transition to your next journey. But how do you write a good resignation letter? What should you include, and exclude? 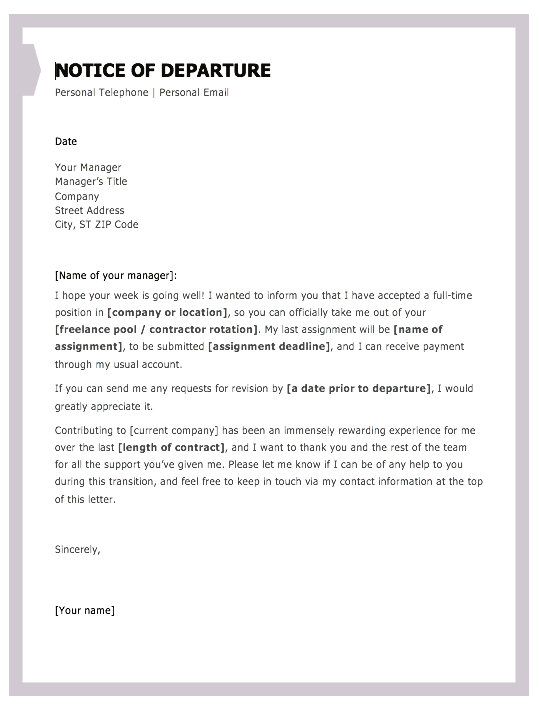 Writing a resignation letter can feel like a daunting task, so we’ve created a professional resignation letter template to get you started, and included examples for inspiration. Below is a professional resignation letter template. Remember, your letter should be brief, and only include relevant and helpful information. Don’t focus on the advantages of your next role. Instead, take the time to reflect on any appreciation you feel for the company you’re leaving behind. I would like to inform you that I am resigning from my position as X for Company A, effective December 21. I appreciate the opportunities for professional development that you have provided me over the past two years. I have enjoyed my tenure at Company A, and in particular feel honored to have been apart of such a supportive team. If I can be of any help during this transition, please let me know. I am available to help train my replacement, and will ensure all my reports are updated before my last day of work. Thank you again for the opportunity to work at Company A. I wish you all the best and look forward to staying in touch. You can email me at X. Begin your letter by stating your position, and the company. This might seem superfluous if you work at a small company and your boss knows you well, but since the letter is your official termination, it’s important to include. Then, quickly follow this information with a simple statement of your resignation. Also, providing an end date in the first body paragraph is helpful, since that’s one of the first questions your employer is going to have. Paragraph 2: Reflect on the positives. Take the time to consider how you’ve grown, or what you’ve appreciated most about your time at the company. Be as specific as possible — perhaps the company provided professional development opportunities, or maybe you’ve appreciated the climate the company fostered, and the supportive atmosphere. It’s nice for your employer to receive a thank you for the time and resources she’s used to support your career growth. If you’d like, you can include where you’re headed next, too. If you’re switching industries to pursue a passion, or going to graduate school, it might be appropriate to include. However, if you’re leaving the company for a competitor, you might feel it better to omit. Paragraph 3: Offer to assist in the transition. In the third paragraph, mention your willingness to make the transition easier. I’ve written, “I am available to help train my replacement, and will ensure all my reports are updated …” This sentence might look different for you; regardless of what you write, it’s impressive if you include specific details regarding how you’ll help. *Paragraph 4: Outline your workload. As an optional follow-up paragraph, briefly review the work you’ll be surrendering when you officially leave the company. Although it is technically your manager’s responsibility to pick this work up and determine how it will continue, it’s helpful to list all the projects and tasks you’ve been in charge of to make the transition even easier on the company in the interim. This is especially true if you managed any direct reports or collaborated with other departments. *Paragraph 5: Provide personal contact information. Lastly, I’ve written, “You can email me at X.” This is optional, but if you truly want to keep in touch with your old employer or use her as a resource, it might be a good addition. *These two paragraphs are optional sections. Depending on your position and your relationship with the company, you might not need to include. 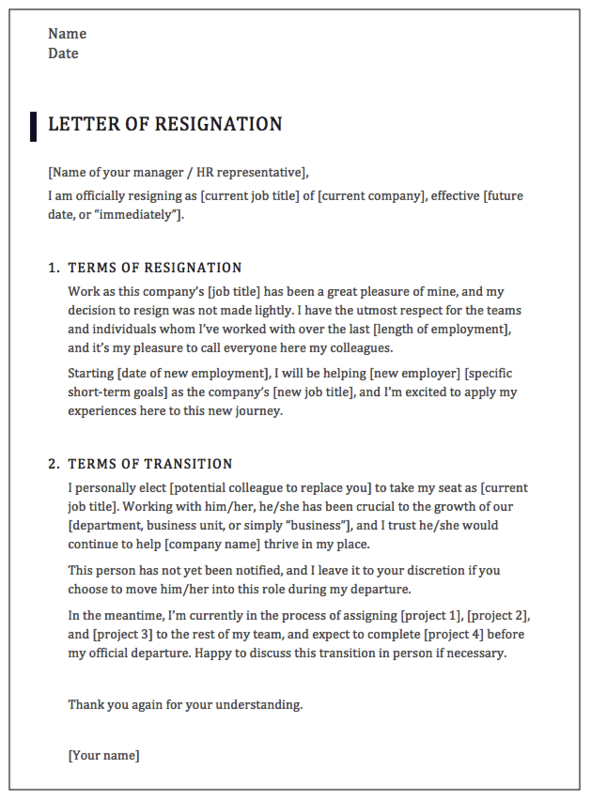 With the above template in mind, let’s take a look at a few sample resignation letters for different positions, each of them taking a slightly different but amicable tone to their resignations. I would like to inform you that I am resigning from my position as Data Analyst for Company A, effective January 3. I appreciate the opportunities for professional development that you have provided me over the past four years. I have enjoyed my tenure at Company A, and feel grateful to have started my career alongside such a dedicated team. I have accepted a teaching position in Virginia. While my experience at Company A was rewarding, I’m excited to pursue my passion for teaching. If I can be of any help during this transition, please let me know. I am willing to help out with freelance work until you find a replacement. Please accept this letter of resignation from my position as content creator at Company Y. My last day of employment will be June 1. It has been a pleasure working with you and the team for the past two years. In particular, I’ve enjoyed tackling extensive copywriting projects as the business has grown. I’m very appreciative for the opportunities to develop my skills in the field, and want to thank you for all your guidance and insight. I wish your company much success. Please let me know if you need any assistance with the transition. Sometimes, the nature of your position merits a more specific letter of resignation when you leave. Below are a couple of templates that help these more dynamic roles make a graceful departure from the company. Both templates below open in Microsoft Word. Simply click on the image to download and edit your resignation letter. If you work freelance, you might need to adjust the focus of your resignation letter so it addresses your final assignments and how exactly you’ll be parting ways with your client. This includes your current assignments, which tasks you won’t be able to complete, and how you’ll accept your final payment. If you’re in an executive- or senior-level leadership role, a quick email or two-paragraph notice to your superior might not suffice as an official resignation. Because these roles are harder to fill, you might play a bigger role in the transition period — especially since you manage more people and decide on the direction of more projects. The template below separates the resignation into two sections — the first is the resignation itself, and the second is how (and with whom) the resigner’s work will continue. No matter what your role is, why you’re leaving it, and who you’re informing, be polite in your resignation letter. Gratitude and support during your departure go a long way with employers, and the last thing you want to do is leave the company on a sour note — even if you’re leaving for sour reasons. With the samples and templates above, you’ll protect your bridges and keep your professional network intact as you start your next adventure.